FollowGrams is a new Kickstarter project that brings the power of a projector to help kids learn. Not only can little ones learn how to draw by tracing, but FollowGrams can also be used to teach letters and numbers. The projector is recommended for kids 5 and up and is supposed to help develop fine motor skills. 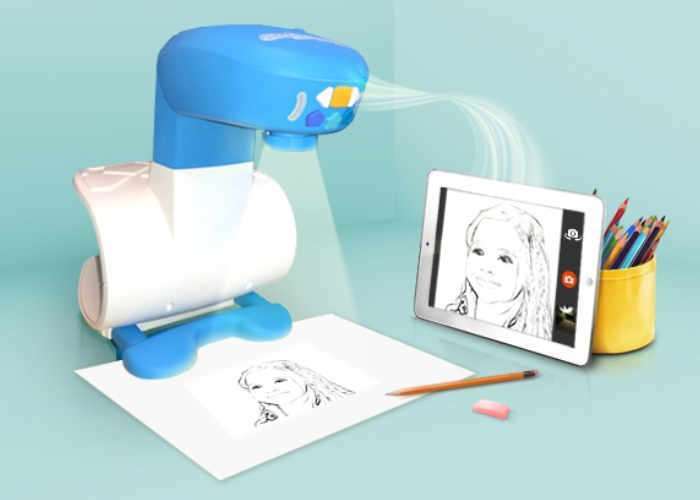 The FollowGrams projector is basically a desktop device that has clearly been designed for its target audience of budding artists aged from five years-old. Its chunky plastic looks suggest it should be sturdy, and parents will also be pleased to know that when not in use the projector will only take up half as much space as it can be split into two parts, with one being stowed within the other. In terms of desk space requirements, it measures 27 x 19 x 33 cm (10.8 x 7.5 x 13 inch) when assembled. There are two main ways the FollowGrams projector can be used, the first is in conjunction with an iOS or Android app which allows users to send images via Bluetooth to be projected and traced. As soon as an image has been decided on at the smart device, a filter is chosen to transform it into a more line-primarily based traceable photograph and despatched to the projector. It then shines onto a sheet of paper, permitting your little Picasso to copy it the usage of their ordinary real global creative tools. The second mode, is potentially greater interesting and offers step-through-step commands displaying a way to draw some of one-of-a-kind pics. Here users observe lines as they are sequentially projected onto the paper, until a full image has been created. this can make the manner less daunting for more youthful users, and facilitates to train key drawing talents. It will currently take a super early bird pledge of US$65 to put your name down for a FollowGrams projector with three content cards. Once those go the pledge level will rise to $75 with two content cards, and then to $99 with one content card. If funding, and everything else, is successful, the FollowGrams projectors are expected to start shipping in July.